“What features merged since the last release?” – “Did we introduce something which might break a deployment?” – “Let me grep through the commit history to check what happened.” Remember sentences like these when you’re about to release? If you like this fire-fighting mode, ignore this post. If you want to have a more relaxed release, this post will show you how to use a tool called reno to manage your release notes. reno creates its release notes in a directory releasenotes under the root directory of your project. A release note is a YAML file which uses a combination of the name you provided and a hash-like text. This ensures uniqueness in file names. 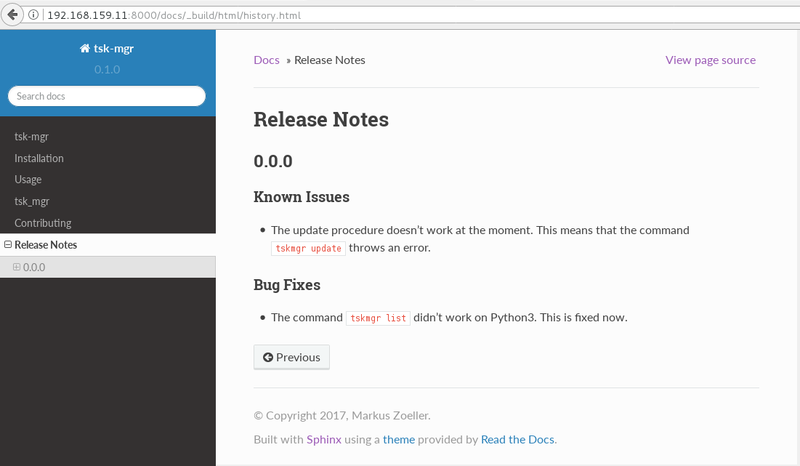 The default template which our release note is based on used embedded restructured text for the markup of our prose. The report combines all of our release notes (only one so far) into something you can use in a release letter. The report also lists a version number (0.0.0 in this example) which can be influenced with git tagging. The next sections will dive deeper into specific questions on how to use reno in your (most likely code driven) project. This is a non-exhaustive list. It depends on your users what you add. reno  is a tool to manage the release notes of your project. It got developed to fit the needs of the OpenStack upstream development, but it can be used in any other project as well and this post will demo a few of its capabilities. This post contains an example application (called tsk-mgr) we will use to demo the usage of reno in a more real-world manner. tsk-mgr is a TODO list management tool with a CLI interface and persistence by using the Python shelve library . It has a docs directory which uses Sphinx  as documentation generator. The structure of the app got created with cookiecutter . Doing this in a virtual machine is entirely optional. You could also do it in a Python virtualenv, a Docker container, a chroot or your local laptop. $ tskmgr create "Write a post about reno"
Under the covers, this uses the sphinx-build command from Sphinx, but we won’t dive deeper into this. Further reading can be found at . Now you can access the documentation in your local browser via the URL http://192.168.159.11:8000/docs/_build/html/index.html. The IP address got specified in the Vagrantfile and the port 8000 is the default for SimpleHTTPServer . If you don’t like to use it anymore, destroy the environment with vagrant destroy -f and remove the directory. You’re laptop will be clean like nothing happened. It’s empty for now, as we haven’t yet added a release note to this project. I used the prefix ki for known issue, but that’s entirely optional. command ``tsk-mgr.py update`` throws an error. The > char is YAML folding syntax. It replaces every line break with a space. If you want to keep the line breaks as you specified them, use the | char. More details at  or the official spec . $ git commit -m "Add known issue about update"
Here you see that the embedded restructured text in the YAML file can be interpreted and rendered by the reno Sphinx extension. This allows you to format the release notes for easier consumption for your users. The examples before showed the usage of reno when no code was involved. We change this by doing an actual fix in the application. +    The command ``tskmgr list`` didn't work on Python3. This is fixed now. That’s the beauty of release note management with reno. The documentation is part of the very same code change. $ git commit -m "even more release notes"
This is a good way to split up the display of the release notes over multiple files, if you’re concerned with showing too much at once. This means the command git branch --list should contain one branch named stable/release-name. If your stable branch naming convention is different, you have to create a reno config file and change the option branch_name_re . Changes to release notes in a stable branch, like fixing a typo or phrasing something differently, need to be done in that stable branch. That’s due to how reno scans for release notes to keep track . A real-live example, of how the usage of reno in a big project can look like, can be found at the OpenStack projects like Nova . The OpenStack community is the origin on reno, which needed something to keep track with the many contributions by their many contributors. The release notes can be peer-reviewed like code. No more “We released a bunch of fixes”. The release note is part of the code change which makes the release note necessary. Write it while your memory of the impact is still fresh. Backports to stable branches already contain the release note. There’s no way to miss the notes. Merge conflicts to the overall release letter are next to impossible as every developer works in an extra file which gets combined later. Have a (customizable) template of release specific sections which are the most important ones for your users. A Sphinx document generator plugin is available. No copy & paste to another place necessary. When OpenStack introduced the usage of reno, it became apparent that there was a little confusion about when a change needs a release note. Having a written guideline will help you to introduce reno for your project. It also helps a lot if you know your users as you write for them. Operators are often concerned about deprecations and any upgrade impacting actions they need to do. At the end of the day, the release notes are a communication vehicle with your user base. Make the best out of it.